This past Labor Day we were walking around the Hamilton RBG Arboretum when I spotted this wonderful bird land on top of a tree not too far from me. I slowly walked up to the tree with my camera in hand and stopped and took a picture, moved forward. Although he always had one eye one me I believe he stayed because he was more concerned with the flock of turkey vultures flying overhead. When they got to close he took off, but not before I got some amazing pictures of him. Thank you so much for sending this to us, your pictures are great. Perhaps one of our expert birders will be able to give you a definite ID of this bird. I will also post this on our facebook page. I believe this is a Red Shouldered Hawk. 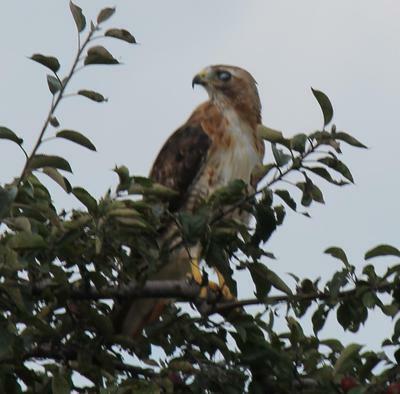 In the buteo family and has some characteristics of the Red Tail. It's still great you had seen this up close beautiful bird. If you like take a look at the post my neighborhood squirrel chaser, I posted this of a few Red Tailed Hawks, one even on the grass, and you may understand why I thought it was some other bird of prey because you will see the difference in the colors. Hope you see more and different species that's why I keep my eyes in the sky. Daniel. No problem Ted, it's strange because I see Red Tailed Hawks all the time in my neighborhood and your picture just looked different and you are right the Merlin is very small in comparison to the Red Tailed Hawk as it is one of the largest Hawk species, the eyes and top of the neck just threw me off because the colors looked so different. I just love having all this beautiful wildlife in Toronto, Ontario and this beautiful country such a lovely sight in such a large city. Hello Ted, I believe what you had possibly seen was a Merlin. They mostly inhabit B.C. Canada, but do sometimes come farther southeast. Look one up and I believe you may possibly agree this is what you had seen. Many birds species, not only birds of prey, pass through Ontario as their migration routes are along the way. Hope this helps you. 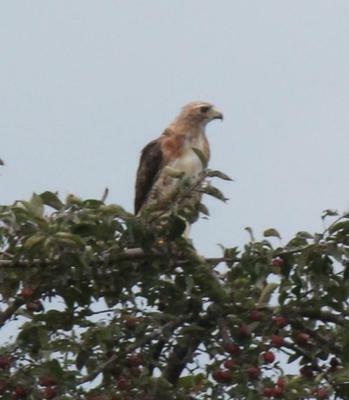 This is definitely a Red-Tailed Hawk...notice the tips of the tail feathers. Very pretty. 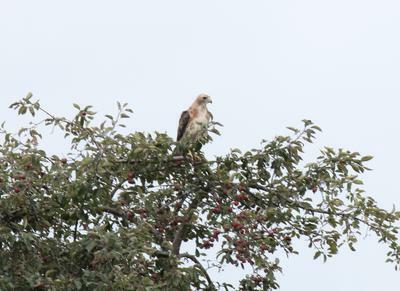 My 12-year old birder son informs me that it is likely a Swainson's Hawk. They are not common in Ontario, so this is a good find. Looks like a Cooper's Hawk. 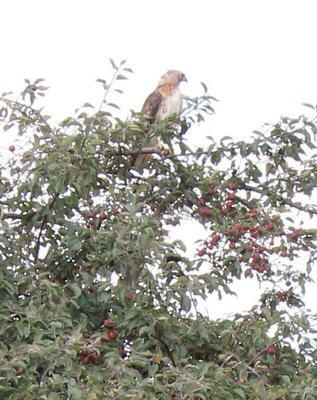 This is a Red-tailed Hawk and is quite often seen on lamp posts and the top of trees along the highways. We had one for a number of years sleep in a tree on our front lawn in a residential area. Robins also slept in the same tree and would squawk for hours before settling down, but often the hawk would have enough and fly to a tree across the road to sleep in peace.